Grip it and rip it is outdated. In this age of adjustability and drivers with more settings than your old VCR, perhaps the new terminology ought to be Set it, Grip it, and then Rip it. Its been ten years since TaylorMade brought us the R7 with its changeable weights, and just five years since Nike debuted a driver with an adjustable hosel to change lie and face angle. Today, it seems almost all drivers feature some degree of adjustability, although those that don’t still pack in plenty of technology and features. What follows is a review of some of the top drivers in terms of performance and popularity. Perhaps the driver receiving the most buzz this year is the TaylorMade SLDR. 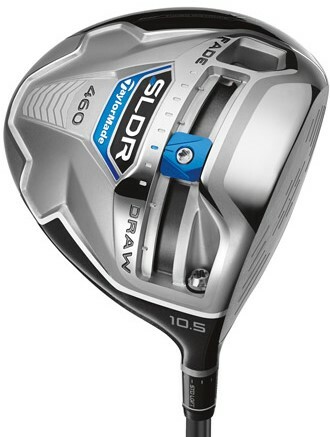 Their “Loft Up” ads and tagline are the result of the need for golfers to buy a driver with a bit more loft than they are typically used to because of the low and forward center of gravity (CG). TaylorMade set the CG low and foward, as opposed to low and back, to promote low spin off the club face. Low spin, for higher swing speeds and at the right loft, means more distance. 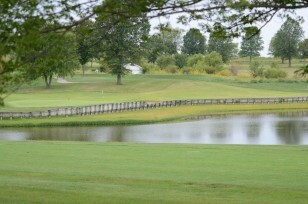 The club also features a 20-gram moveable weight mounted on a track along the sole. Moving the weight to the toe promotes a fade while moving it to the heel will help create a draw flight. Added to all this is the Loft-sleeve that has been featured on other TaylorMade models and allows loft and lie adjustments to one of twelve different settings. 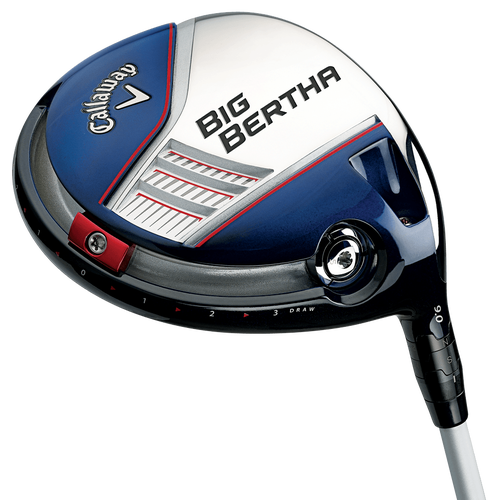 Remember the Callaway Big Bertha – the driver that revolutionized metalwoods and started the era of increasing driver head sizes? Well, it’s back. The 2014 version of the Big Bertha is a 460cc version that piles on new technology designed to create a longer, straighter ball flight – something almost all golfers are looking for. The adjustable hosel can add up to two degrees of loft or reduce it by one degree. Along the back of the club is an 8-gram weight that, like TaylorMade’s SLDR, is mounted on a track allowing the weight to be locked in one of multiple positions. Unlike the SLDR, though, the track is along the trailing (back) edge of the sole, placing weight in a more traditional place to promote a higher ball flight. Golfers will need to work with a fitter to get the settings just right for their particular swing speed and shot shape, but once dialed in, the Big Bertha will yield long fairway splitters. 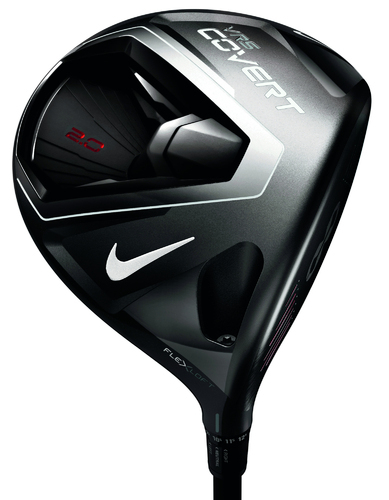 The Nike VR_S Covert 2.0 has perhaps the most unique design of all the drivers this year, representing improvements over the original Covert driver. Like its predecessor, the 2.0 version features a cavity back design with a sizeable wedge removed from the back of the clubhead to position weight at the toe and heel and promote a straighter ball flight from a more stable head through impact. 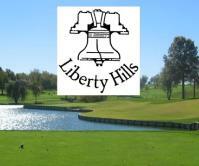 The end result is a very forgiving club that provides a significant amount of forgiveness. While introduced in a striking red finish, Nike recently revealed a matte black version. The hosel allows the club to be adjusted from 8.5 degrees of loft up to 12 degrees. Ping has a pair of drivers worth noting as well. The Ping G25 and i25 drivers are aimed at different types of golfers and bring a host of features to their respective designs. 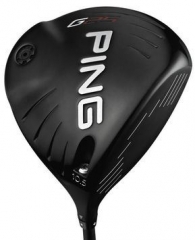 The G25 is a distance driver with a matte black finish on a slightly elongated head shape. 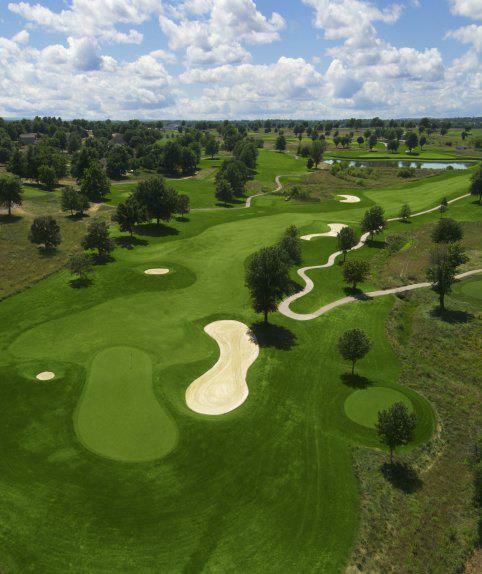 Its a fairly high launching, mid spin driver meant to help golfers launch the ball high and straight and should be very appealing to golfers with slower swing speeds. Its hosel allows a half degree of loft adjustability. The i25 is a very low spin driver that provides a low piercing ball flight with plenty of distance. For its shape and design, its a straight driver that still provides some ability to work the ball left or right, as needed. These manufacturers have many more options available, as do numerous other clubmakers. The new drivers of 2014 have kept improving on the technology of their predecessors, allowing anyone with the knowledge to dial up their desired ball flight. Just remember to set it – before you grip it and then rip it. 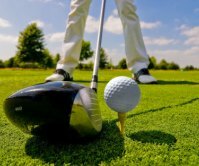 The golf swing is dependent on correctly doing the previous move. Therefore, a solid takeaway promotes setting the club correctly at the top of the backswing, which in turn promotes returning toward impact with the club on the correct plane, path and face angle. Many players create a poor position at the top of the backswing. While the goal is to set the club correctly at the top of the backswing, many players allow the club to get across the line or laid off at the top. Both positions can lead to undesirable results. The club should point to the target at the top of the backswing. When the club points to the right of your body and the right of your target the club has come across the line. The prototypical swing positions the club pointing toward the target and parallel to the target line at the top of the backswing. Many players pick the club up too steep during the backswing, resulting in the top position across the line. Blocked shots to the right and hooks are a common result for getting the club across the line at the top of the backswing. The picture to the right demonstrates the club across the line at the top pointing to the right of the target. 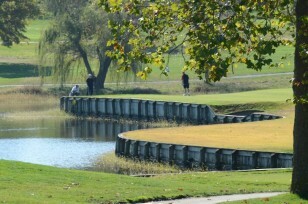 Many recreational players allow the club to reach a laid off position at the top of the backswing. 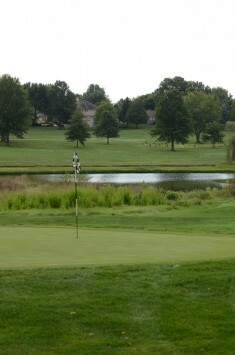 The club is laid off when the club points away from the golfer and left of the target line at the top of the backswing. 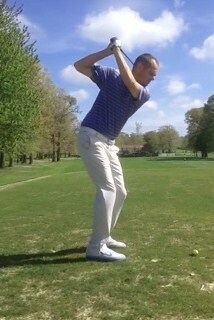 From a laid off position the hands must rotate quickly through impact. Shanks often result when the hands do not rotate quickly enough. A shank results when the hosel of the club head strikes the ball causing it to squirt off to the right. Additionally, players often pull the shot causing the ball to start to the left of the target. The following tips are designed to get the club set in the proper position at the top of the backswing. Set up to the ball correctly. Check your alignment and be sure your body is lined up parallel to the target line. 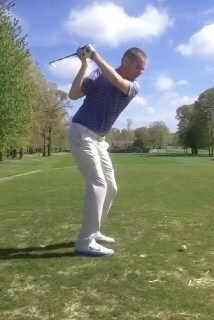 If you set up with your body open to the target line it can encourage a laid off position at the top of the backswing. On the other hand, if your body is lined up to the right of the target line it can encourage an across the line position at the top of the backswing. Position your feet, knees, hips and shoulders square to the target line. The proper take away also helps position the club correctly at the top of the backswing. 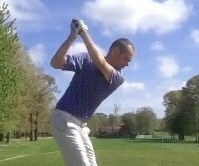 A flat and inside take away can lead to a laid off backswing. Try to avoid the club head getting behind the hands during the takeaway. Place an object such as a head cover about a foot behind the ball positioned just inside the target line. Take the club head back low to the ground without touching the object behind the ball. Also, avoid the object on the downswing. This drill will help swing the club on a vertical swing plane, rather than a horizontal swing plane. In addition, it will help position the club correctly at the top of your backswing instead of pointed across the line or laid off to the target line. Be sure the club points to your target at the top of your backswing. Practice with a friend standing behind your or in front of a full length mirror to check for the correct position.